You are at:Home»Seattle Storm»The Seattle Storm Through The First Six Games – Who’s Up And Who’s Down? The Seattle Storm have been on a tear through the first six games of the WNBA season, and the outlook is really bright. The team is responding well to Dan Hughes’ new regime, which is producing two MVP candidates right before our very eyes. Last night, the Storm completed a ruthless blowout over the helpless Las Vegas Aces, sending the team into June with a 5-1 record. Jewell Loyd has seriously turned on the jets to start the year. If you ever wondered what it looks like for a basketball player to take the proverbial next step in their career, then take notice of the jump in Loyd’s scoring average. For the past two seasons, she’d averaged a respectable 17 ppg. This year she’s averaging 23 points per game and contributed a big-time 29 points against Chicago back on May 25. Also, is it possible to effectively double your own PER? Loyd isn’t quite there yet, but she’s posted a 32 PER to start the year, after ending last season with a respectable 19 PER. Natasha Howard has emerged as an efficient scorer within the arc. She’s made 65% of her attempts and has healthily contributed with rebounds on the offensive end. She’s also the team leader in blocks and is anchoring the team’s defense. The Storm have been playing so well, that it’d be unkind to have a “The Bad” section, but alas, there are some things that’d be nice to have as the June schedule begins to open. Breanna Stewart has had a solid start to the year, but is probably a step behind compared to past seasons. She’s still a very young player with a new coach, so this stretch is just her finding comfort on the court. Stewart has averaged an extra turnover per game, and has only made about 20% of her shots from three point range. By her standards it’s lackluster, but if she starts to average just an extra made three pointer per game, then it might be more than enough. Stewart has been a really efficient two point scorer this season and is still keeping the pressure up on defense this year. Jordin Canada is still finding her place in the league, but the coaching staff has cemented her role as the leader off of the Storm bench. Canada is still refining her passing touch and her shot from deep, but she’s made an impact on the defensive side of the ball this year by leading the team in steals. It’s not like the Storm need anymore scoring, but I think Alysha Clark deserves a couple of more looks from deep. She’s made more than half of her attempts from deep and has struggled quite a bit inside the arc. Why not just park her in three point land for 25 minutes per game? 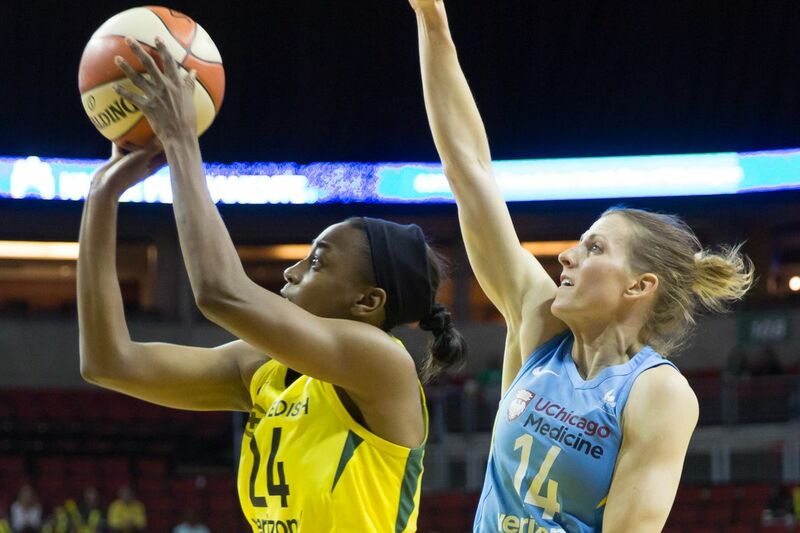 The Seattle Storm travel to Dallas on Saturday in what looks to be a grind-it-out kind of game. The Dallas Wings are a stout defensive team, keeping opponents to a 38% field goal percentage and maintain the second best defensive rating in the WNBA. The Storm look to stay hot from deep, so tune in.